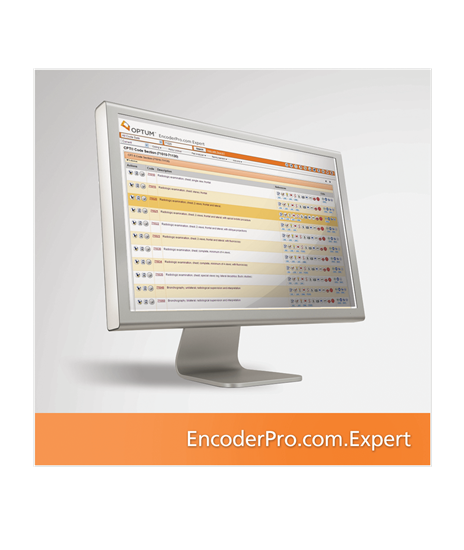 EncoderPro.com Expertprovides online access to a powerful search application for all CPT®, HCPCS Level II, ICD-9-CM, and ICD-10-CM and PCS code sets as well as Optum360 and Medicare coding guidelines to ensure coding accuracy, improve billing performance, and reduce rejected claims. Complimentary monthly updates let you code confidently throughout the year. Plus, a compliance editor powered by Optum360’s ClaimsManager helps you review your code selections, and a fee calculator computes the Medicare reimbursement rate for your region. ExpertExclusive—Enhanced claim review(with Optum360 ClaimsManager rules). Check your work by running your selected codes through an automated edit review to ensure proper unbundling, correct modifiers, complete diagnoses, and more prior to submittal to a clearinghouse/vendor/payer. Includes access to a 24-month historical content database for use during claim adjudication. Over 130 coding rules are reviewed. ICD-10-CM and PCS.Includes mapping content from ICD-9-CM volumes 1 and 3 codes to ICD10-CM and PCS codes (as well as backward mapping) using the GEM (General Equivalency Mappings) and Optum’s MapSelect clinical mapping content.Also includes ICD-10-CM and PCS searching and Optum tabular (ICD10-CM and PCS books) content. Store your most frequently used codes for easy access and export your codes to Windows programs.